Increase in salinity levels poses a threat to many hot and arid farming areas in the Middle East and North Africa region. In some cases, farmers install desalination units to produce freshwater to irrigate high-value crops. However, the produced reject brine is an environmental hazard since it is disposed off in the soil creating a vicious circle of salinity aggravation. The current work focuses on the financial aspect of using the reject brine, generated from reverse osmosis (RO) unit, to grow fish (Sparidentex hasta, sobaity sea bream) and halophytic species (Salicornia bigelovii, Distichlis spicata, and Sporobolus virginicus) for various uses in an integrated farming approach. Different water treatments (RO brine, RO brine mixed with groundwater, aquabrine, and aquabrine mixed with groundwater) were tested to evaluate their impact on halophytes’ growth and production. Irrigating with RO brine resulted in positive net returns for S. bigelovii, directed for fresh tips’ production, as well as for the grasses D. spicata and S. virginicus. However, more returns were obtained when RO brine passed through the aquaculture system where it got enriched with more nutrients due to fish waste. Irrigation with brine from the aquaculture system tripled S. bigelovii production (23.7 t/ha) and increased returns per ha of approximately US $76,000 over irrigating with RO brine directly, compared to the US $5571 and the US $1884 for D. spicata and S. virginicus, respectively. Halophytic crops constitute one of the very few sustainable options to improve food and nutrition security in salt-affected regions, contributing in lands’ rehabilitation and enhancing farming livelihood income. 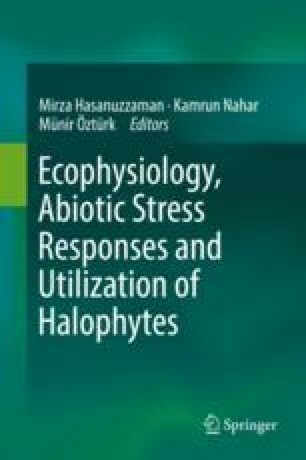 Halophytes also constitute an imperative component to consider for nutrient-dense production systems such as integrated agri-aquaculture systems (IAAS) implemented in desert environments, and the strengths, weaknesses, opportunities, and threats were explored through a SWOT analysis. The current study was conducted as part of the collaborative project with the title “Improving economics of using saline water in arid and semiarid areas through IAAS” between International Center for Biosaline Agriculture based in Dubai, United Arab Emirates, and International Water Management Institute based in Colombo, Sri Lanka. The project was funded by United States Agency for International Development through Further Advancing the Blue Revolution Initiative (FABRI). Finally, the authors would like to thank Mr. Khalil Rahman and Mr. Balagurusamy Santhanakrishnan for their assistance in data collection and field activities.